Typical Atlantic Canadian suburban ell configurations. What is an ell? It is an extension often attached to the back or a side of a building at a right angle. Historically, it was sometimes written as “L” because of the footprint that is configured in connection with the main body of the building; although it appears as though it more often produced a “T” configuration. An ell generally has the appearance of being an addition but it would be a mistake to assume as much. By the 1840s, the ell was such a valued architectural arrangement that house plans commonly called for its inclusion. But why design something that looks like an afterthought? The reasons are manifold. One reason why an ell might exist is a matter of scale. Having an extension at the back of a structure permitted a more or less standard, or even modest, scale of façade in building a house. For the sake of style and aesthetics a house of a certain frontage often required a corresponding depth. As well, the gable end of a house was generally shorter than the side under the sloped roof. All the dimensions were important – even height demanded a proper proportion with length and width. Symmetry too, in many cases, was not to be violated. Roof pitch had to be considered. With such constraints, how was a builder to accommodate a large family without scaling the house plans up to a proportion that was, well – out of all proportion? The answer was… to build an ell. Another reason for an ell was fashion or something called “correct taste.” It was agreeable to have a kitchen that was, to some extent, removed from the rest of the house. This could be achieved with a cellar kitchen, or clever room configurations that isolated the kitchen, or with an ell. Kitchens produced smells associated with domestic work. Odors and gases that might emanate from a kitchen sink were considered offensive and even harmful. It was believed that food prep smells should not be wafting through the house but be confined to the domestic work station. Nineteenth century house descriptions indicate that kitchens were typically not even considered rooms. They were somehow ranked just below official room status – so that both physically and conceptually the kitchen was a separate entity. It is becoming easy to see why real estate ads of the period, generally quite brief, take care to mention this feature of ells, or back kitchens, as they were sometimes called. It was an advantageous and therefore saleable configuration. Isolating a kitchen also satisfied the desire to isolate domestic help. The only other components to having domestics remain unseen were to provide them with easy access to the stairs of any connecting upper or lower floors and a service entrance. 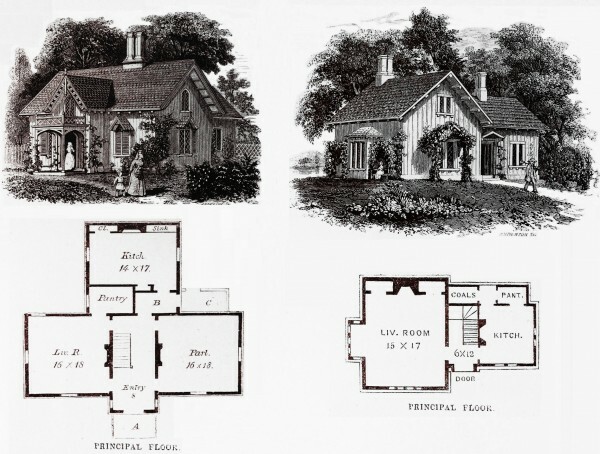 Two house plans showing different ell configurations from Downing’s Country Houses (1850) p.78 and p104. A service entrance connected to an ell or “back kitchen” had the additional advantage of facilitating home industry. Auxiliary rooms connected with an ell often contained workspace for the production of a variety of wares. Dooryards off kitchens provided for easy reception of unprocessed produce into the kitchen and for finished goods out of the kitchen. The kitchen dooryards themselves provided further workspace for home industry connected with the kitchen. Fortunately, the ell didn’t have as many rules to follow as the front of the house. Actually it appears it really only had one – to be subordinate to the main house body. Now, the great difficulty with an ell is in discerning its provenance. Is it original to the building? Was it an addition? Or perhaps it even predates the main building – as with a small structure moved and repurposed as an ell? Investigation as to how an ell is connected to the main body will provide clues and likely answer any of these questions.